We have a selection of shearling rams and ewes for sale. They are all by Solsbury Silas and can be registered with the Jacob Sheep Society if required. If you are interested in getting into Jacob sheep do come and see us - we would be happy to show you round, give you help and advice and, for newcomers to sheep keeping we can also offer a half day course on basic husbandry to get you started! Jacob lamb is naturally lean, tender and full of mouthwatering flavour. Our lamb is produced just from the best Staffordshire grass - and you can taste the difference! We have very high welfare standards and believe in only the best for our animals. We use a local butcher who shares our passion for traditional and rare breed meat . We know that our sheep are treated with respect and compassion. Why not try a half lamb freezer pack? It costs just £45 and you will get two juicy leg joints, three bags of chops and three bags of minced lamb - great for shepherds pie or moussaka. Other cuts can be supplied - just give us a call. We are very pleased to announce that we are now able to offer a small selection of woollen goods to order. 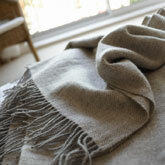 Jacob wool is blended with Mohair and woven to create beautiful woollen throws, blankets and scarves. These are superb quality and will last a lifetime. 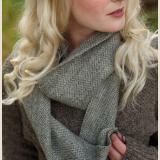 Jacob wool can be seperated into various different shades from cream to dark brown. When the different colours are woven together the resulting shades of soft natural greys and browns complement any colour scheme. Order yours now using the contact form or give us a call. Gorgeous, fluffy sheepskin rugs make a great gift or why not treat yourself? Jacob sheep are white with brown splodges - highly individual - each rug is totally unique. Our rugs are processed for us by a Devon-based tannery ensuring a consistent and high quality product. They are tanned using traditional methods and finished beautifully. They look great on the back of a leather sofa - or why not put one at the side of the bed to warm your toes when you step out of bed!